This is the most famous quote from Isherwood's 1939 novel Goodbye to Berlin. It is also the central theme of the text, which is a series of observations of 1930s Berlin. It was the sense of reflection and recording that I wanted to capture in this book cover. I imagined Isherwood sitting outside a cafe in the German capital, drinking a hot beverage and observing and writing about the world around him. This led me to the image of the cup and saucer. The shape of the cup looks like a camera lens, especially with the reflection reversing the image like a camera does. 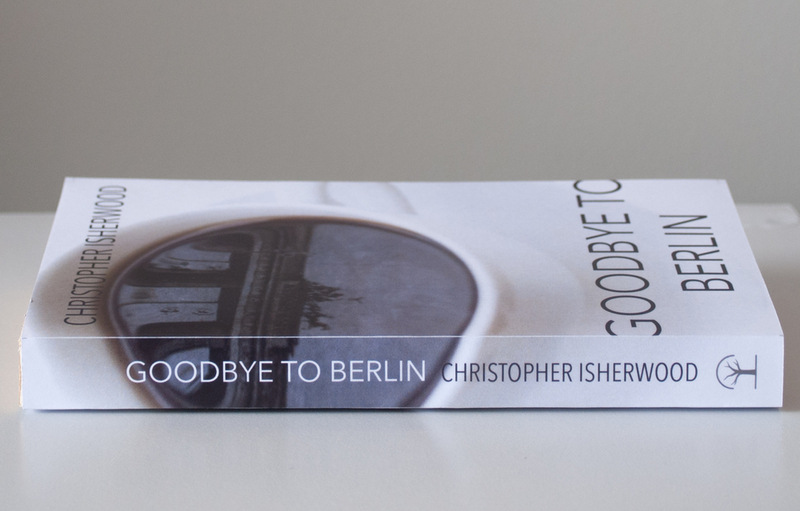 Capturing a reflection of 1930s Berlin in a teacup was no easy feat. I wanted the design to look as realistic as possible, so decided that it would be better to make it as 'real' I could, creating the image in-camera rather than with Photoshop. I printed a high-contrast image of the Brandenburg Gate and tried reflecting it into the teacup. This was unsuccessful to begin with because the subject was too dark. I then tried sticking the photo to a window with the sunlight behind to create a sort of light-box. This created enough brightness for the image to show up in the reflection. The images were shot in RAW, which allowed me more freedom when it came to editing. I used the manual settings and overexposed the subject to get a very white, bright image with enough contrast in the reflection. After a first attempt I found that it was much easier to cut out the cup in Photoshop if I put it against a dark background. A navy blue scarf held up with some weights allowed me to do this. I experimented with a number of different compositions. In my initial sketches I considered including a notebook and pen, but when transferred into Photoshop the image became too fussy. I also tried inverting the colours to make a negative image. I really like this result, as I think it makes for a very striking image, but while this went well with the concept of photography, it made the reflection too abstract and the symbolism of the teacup was lost. In the end the simplest image was the best, with the teacup off-centre. This is the final result, and I was very pleased with how it turned out. It goes to show that you don't need a lot of fancy photography gear to make an interesting and unique image.